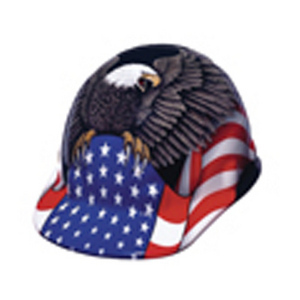 Enjoy the protection and comfort of SUPEREIGHT hard hat with the added protection of high visibility reflective tape on a strong orange hat or the appeal of a patriotic design. The specially formulated fade-proof high-visibility model (not shown) will not fade throughout its service life. Specially selected high-visibility tape provides visibility throughout the various light conditions of a workday. Standard full circumference tape pattern leaves room for a front imprint. The Spirit of America full graphic design will not chip, fade or peel. Both meet ANSI Z89.1 Type 1, Class E standard in forward and reverse positions.